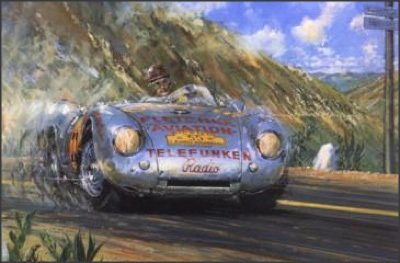 Driving the official works Porsche 550 Spyder and entered by Fletcher Aviation of Pasadena, Hans Herrmann brilliantly won the Small-Sports Class in the fifth and final Carrera Panamericana. Apart from this important victory, he achieved an incredible third place overall, beaten only by a pair of four litre Ferrari’s in the Large Sports Class. As in the previous year, the Porsche expedition to Mexico was master-minded by Huschke von Hanstein, who was both Porsche Racing Director and Press Officer, a dual responsibility carried with flair and expertise for sixteen years. Following this victory, the management of Porsche responded by adopting the Carrera name, reserving it for cars to be developed for competition.